NSW Blues have won the 2013/14 Bupa Sheffield Shield after a rain-affected draw against Western Australia at Manuka Oval in Canberra, with Sunstar client Steve O’Keefe playing a crucial role during the match. NSW elected to bat on a good wicket and were cruising until they lost 5-25 and slumped to 6-189 and in desperate need of a partnership. Steve delivered for the Blues, combining with Moises Henriques to put on a partnership of 90 before Steve fell victim to a dubious LBW decision for 41. But it was a telling partnership. 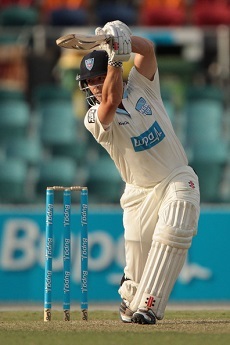 Henriques went on to score an outstanding 140. Josh Hazelwood was the destroyer in Western Australia’s first innings taking 6-50 to restrict them to 180. Steve was only required for 14 overs and finished with the tidy figures of 1-19 which left the Blues with first-innings points. The rest of the match was affected by rain and the game was called off early on the 5th and final day with NSW placed at 4-197 with Skipper Steve Smith posting an impressive 103 not out. This was Steve ‘s first Shield title victory and is a credit to his work ethic and continual improvement over recent years. He finished the season as the leading wicket taker in Australia with 41 wickets at an amazing average of 20. He also now has 126 First Class Wickets at an average of 24.50 from 40 matches which makes him statistically the best spin bowler in the country.